Overseer Network Monitor uses an ICMP ping command to test for availability of a network device. This can be used to monitor routers, switches, Windows servers, Linux Servers, IP Cameras, IP Printers, WAN links, and more to ensure they are available on the network. Overseer ping monitoring can be configured to send notifications when the host is unreachable, latency falls below a specified limit, or packet loss exceeds acceptable tolerance levels. Overseer can ping resources based on DNS name or IP. This provides flexibility and simplicity. Overseer pings using the standard ICMP protocol, using the same packet size as the default 'ping' command line tool, for the best compatibility. Overseer can ping 1 or more times each time it checks. This is useful if you want to check for loss tolerance. 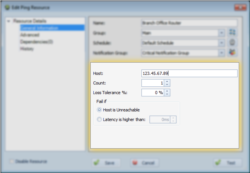 Overseer can be configured to tolerate a specified amount of packet loss. This is useful if you have a relatively high packet loss connection, and only want to be notified of more significant issues. Overseer can check the latency/response time for devices when it pings, and if exceeding a defined threshold, Overseer will send a notification via Email or text message.